New national surveys carried out in 2015 and 2016 in partnership with Angus Reid have generated invaluable updates to the Project Canada Survey Series, The two surveys have simultanteously produced data making it possible to compare the responses of Canadian adults spanning 1975 through 2015 and young adults spanning 1984 through 2016. 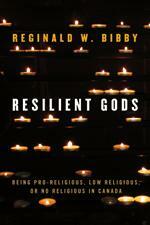 Already the 2015 survey - with a strong emphasis on religion - has provided new information and facilitated updated analyses of faith in the country, published in both with Angus Reid (2016) and Resilient Gods (2017). The 2016 survey, combined with its 2015 counterpart, has provided the foundational data for a new book on youth that will be released by Dundurn Press in the spring of 2019. Entitled, The Millennial Mosaic: How Pluralism and Choice Are Shaping Youth and The Future of Canada, it has been co-authored with Joel Thiessen and Monetta Bailey, two young sociologists at Ambrose University in Calgary. In 1995, the results of the Project Canada Surveys on ten major topcs spanning 1975 through 1995 were published in The Bibby Report: Social Trends Canadian Style (Stoddart). A similar monograph, summarizing the same ten topics from 1975 through 2015, will be released online - probably free of charge - in the fall of 2019. Like its predecessor, it will provide readers with unmatched capsule survey findings on the same centrally important ten topics. They include values, sources of enjioyment, personal and social concerns, intergroup relations, sexuality, religion and spirituality, and hopes for the future. Also still on the drawing board is a unique trends book that uses the pivotal year of Canada's 150th anniversary in 2017 to look back and look ahead fifty years. It will provide a snapshot of Canada Since 1967: The second half draws on his extensive findings, plus the best additional information available - including considerable "expert opinion" - to provide a data-driven and thought-provoking portrait of what life in Canada may look like by Canada's 200th anniversay in, yes, 2067. Depending on the publisher's design choices, the book could be a standard, two-part book. But, more radically, it could be in a "back-to-back" format. The target date for this is a shade elusive, but hopefully will be mid-2020. We'll keep you posted! In late 2013, Reginald Bibby and Andrew Grenville, the Chief Research Officer with Vision Critical, a division of Angus Reid Global, teamed up to write and present what they think is an important paper on polling and service attendance, that was published in the Canadian Review of Sociology in January of 2016. The paper benefited immensely from Bibby and Grenville being able to bring their respective strengths - Bibby, a career of studying religious trends, Grenville the survey research resources of Angus Reid. They continue to collaborate in charting social and religious trends, as well as exploring the kind of life that is emerging in Canada. Grenville is now the Chief Research Officer at MARU/Matchbox, which emerged after the MARU Group acquired the research wing of Vision Critical. 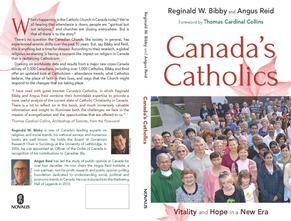 Reg has also co-authored three Commentaries on the new survey research with Angus himself - "We'll be home for Christmas - However it's celebrated" (December 2013), "Christmas in Canada - Merry and Much More" (December 2014), and "The Christmas Clue to Catholicism in Canada" (December 2016). As noted, they have co-authored Canada's Catholics, an empirical reading of the state of Catholicism in Canada that draws heavily from their major national survey of religion carried out in March of 2015. As he considered the possibility of doing another youth book, drawing on the 2015 and 2016 religion and social trends surveys with Angus Reid that provided important data on youth, 18-29, Reg recognized the importance of taking on younger partners who could bring fresh perspectives to the research. He consequently "recruited" two Gen X sociologists from Ambrose University in Calgary - Joel Thiessen and Monetta Bailey. Joel is a full professor at Ambrose whose specialties include family, youth, and religion. His many publications include books with Oxford and McGill-Queen's. Monetta is a recent graduae of the University of Calgary who worked for a time with troubled youth in Alberta. She is an assistant professor at Ambrose, specializing in racialized youth, immigration, gender, and crime. The extensive data collected by Bibby since the 1970s and Angus Reid since the 1980s, supplemented by additional survey data generated by other private pollsters, Statistics Canada, and the Pew Forum, provide us with a wealth of information that can be used to monitor social trends. The dynamic nature of life means that ongoing readings are required to trace both the expected and unexpected. Angus Reid has been playing a central role, along with Andrew Grenville and Maru/Matchbox, in woring with Bibby to produce such new readings. Along the way, some of the findings have been immediately shared, beginning in November of 2013 with the theme area of leisure and the interest that Canadians have in various professional sports leagues. In December of 2013, important material on the Christmas activities and seasonal attendance in Canada, the U.S., and Britain was produced, and the initial findings released. That was followed by a three-setting survey in March of 2014 on beliefs concern life after death and interaction with people who are no longer alive. In December of 2014, a follow-up to the Christmas survey of a year before moved beyond activities to the question of why the season is so important to Canadians. In March of 2015, Bibby and Reid collaborated to produce the 2015 Angus Reid Institute religion survey, that provides a comprehensive, updated reading of religion in Canada. In October of 2016, they again worked together to produce a 2016 Social Trends Survey. In December of 2015, Reg worked with Andrew Grenville in ensuring that some key items from the Projecct Canada adult surveys were included in a number of omni surveys, thus providing invaluable Project Canada data for 2015. In February of 2015, Andrew and Vision Critical partnered with Reg to carry out an unprecdented examination of interest in sports in both Canada and the United States. The samples consisted of some 4,000 people in each of the two countries. The two surveys are unmatched in scope and sample size. An update survey on sports interest in Canada was completed in April of 2016, on the eve of the opening of the Major League Baseball season. As indicated, data from these surveys have been used and continued to be used in a large number of books, papers, articles, and press releases. New survey material will be generated in early 2019. A new exposition of the important segment of people "in the religious middle"